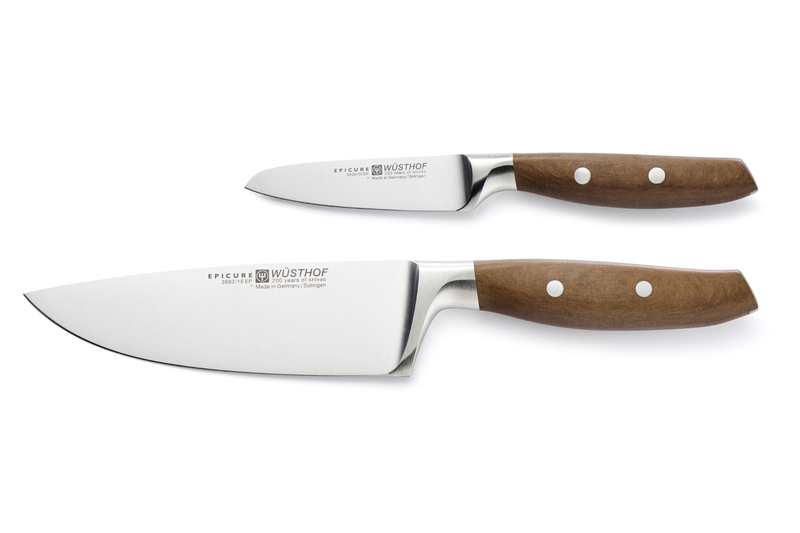 The Wusthof Epicure 2 Piece Knife Prep Set is a great start to any chef's knife collection. This prep set includes a 3.5 inch paring knife and a 6 inch chef's knife incorporating German design with precision honed German steel. The Epicure collection also has a distinctive American-made wood fiber handle. Add this set to your kitchen today! New blade shape featuring modern design. Innovative handle design made from fine wood composite materials. Handles especially designed to reduce fatigue. Look's stylish in any kitchen. Each handle is fastened with the Wusthof classic two stainless steel rivets. Includes 3.5 inch paring knife and 6 inch chef's knife. Clean your knives right after use. Wash with warm water using dish soap and a damp cloth. Wusthof knives with wooden handles are not suited for dishwashers. Store your knives correctly after use. Use a knife block, magnetic holder, or specialized case or roll. Do not use a dull knife. Hand-held sharpeners, honing steels, or whetstones can be used to keep knives sharp. Or take them to a professional knife sharpener. See package instructions for further details.